Yet another recipe for the summer with minimal time to spend inside the hot hot kitchen – only intermittent kitchen supervision needed. In fact, to cut it even shorter I did something I never do – used readymade pasta sauce. Lazy times lazy measures. But honestly, I thought even if you used regular tomato ketchup noone would mind. There are already too many cool things in this casserole. Think it required just about three shoort trips to the kitchen. 1) to cook the pasta and the minced meat 2) to assemble everything and stick it in the oven and 3) remove from oven and serve. And I finally got to use the domitware baking dish I was eagerly waiting to use – isn’t it so period and pretty? If you are using Italian durum wheat pasta, boil it for about 8 mins and rest in the warm water for another 2 mins before you drain it. Boil the minced meat in enough water, skim off the impurities that form on top of it. Heat a tbsp of olive oil in a wok, add a crushed garlic clove, add the minced meat and brown it. 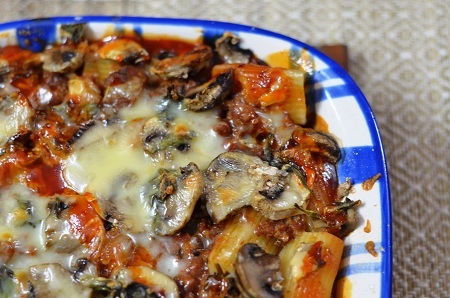 Assemble in the baking dish, layer of pasta and meat sauce, topped with sliced mushrooms, cheese, basil leaves. Although one can use any pasta for this, for some strange reason this works best with rigatoni/penne/ziti/macaroni kinds. 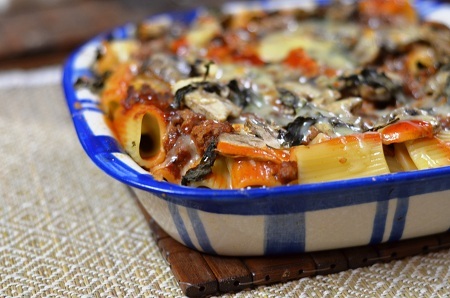 In fact, I recently saw a recipe stuffing the rigatoni with ricotta before baking it. Going to do it pretty soon! If you are using Indian pasta (regular/non-durum wheat), boil it for a couple of minutes lesser and drain immediately else they have a habit of going mushy too soon and annoyingly sticking to your teeth. Adding a dash of olive oil while paste is boiling may not be necessary to not make it stick, but the resultant surface tension sure helps in prevention spilling of boiling water and thus saves you from supervision.